To make dip: In a food processor, add the beans, chickpeas, jalapeños, garlic, cilantro, zest and juice of 1 lemon, smoked paprika, chili powder, salt, pepper and cayenne pepper. Pulse to start, the turn to high. Stream in the olive oil and process until smooth. Use a spatula to scrape down the sides, process for another 10 seconds. Cover and chill until ready to serve. To make tortilla chips: In a shallow, heavy pan, preheat 3 cups of canola oil to just above medium heat for 8 to 10 minutes. While the oil is heating, take 5 tortillas at one time and slice them in half. Stack the halves and slice into thirds. You should get 6 chips out of 1 tortilla. Add about 15 tortilla pieces to hot oil at once. Using a slotted spoon or a kitchen tool known as a spider, move the chips around while they fry. Turn as needed to crisp both sides. Drain chips onto a baking sheet lined with paper towels and season lightly with salt as they come out of the hot oil. Repeat until all chips are done. Garnish the hummus with green onions before serving. Serve right away or if serving later, cool chips completely and store in plastic storage bag until ready to serve. Cooking beans, chickpeas and hominy from scratch is not so difficult. Soak them overnight, drain, add fresh water and cook at a low boil for a couple of hours. Add salt towards the end of cooking times to ensure soft beans, chickpeas or hominy. Two of my favorites, beans and chickpeas! I could almost eat them with every meal. 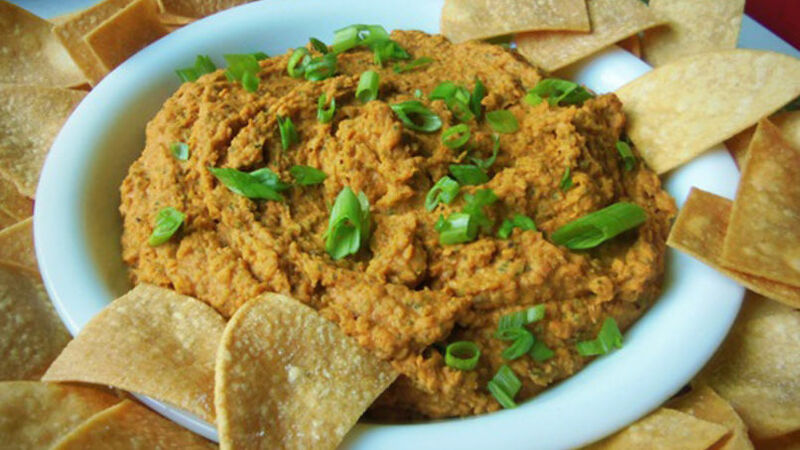 This recipe for spicy pinto bean hummus combines the two, to make for a delicious creamy dip. Pair it with homemade tortilla chips and you will be the hit of your next party or family gathering.